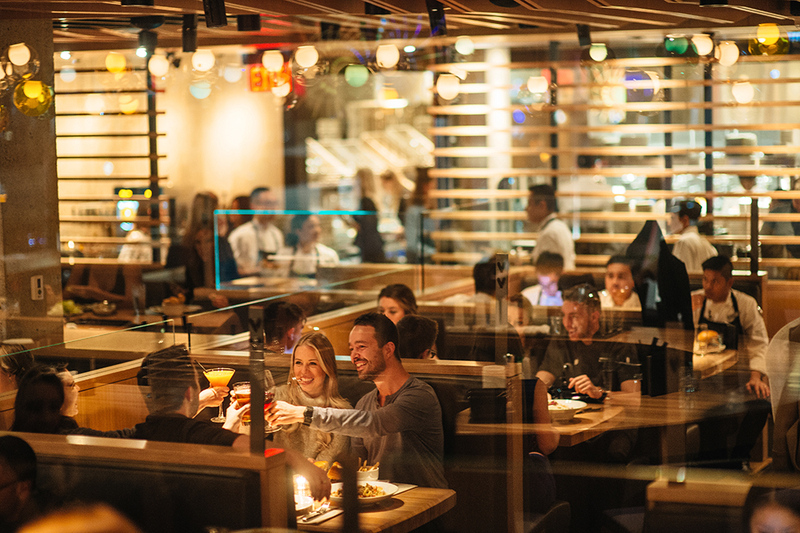 Assembledge+ has continued its ongoing collaboration with Cactus Restaurant Group in support of the Vancouver-based company’s expansion into Canada’s western provinces. 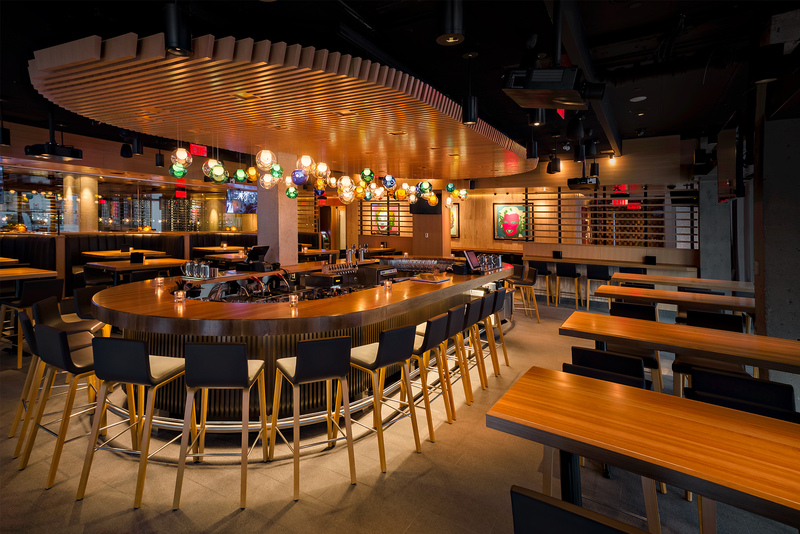 At 6,700 square feet, Cactus Club Café: Stephens Avenue accommodates up to 228 seats with an additional 1,300 square-feet and 88 seats on the wrap-around patio. 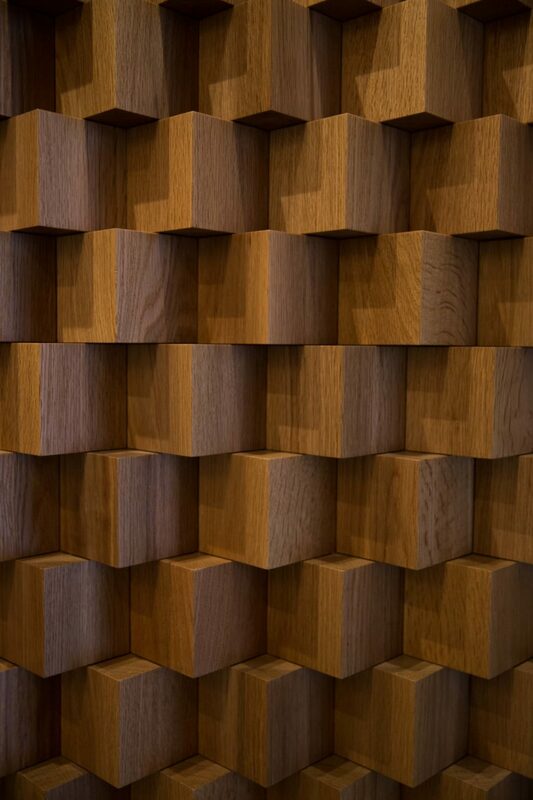 The interior has been designed using a refined palette of oak, blackened steel, glass, and stone, to echo the natural materials found in the West Coast Canadian landscape, featuring oak and stone-clad walls, paired with a unique tile flooring. Long wood and curved ceiling slats inspire movement throughout the space creating a striking yet complementary contrast against the linear geometry found throughout. 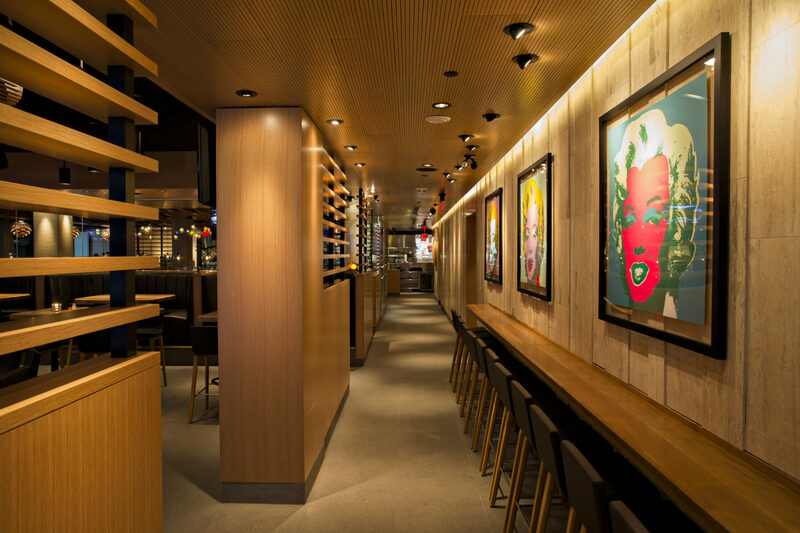 Furnishings include butcher-block oak tables and deep brown leather seating while glass partitions and horizontal paneling section the different dining spaces. 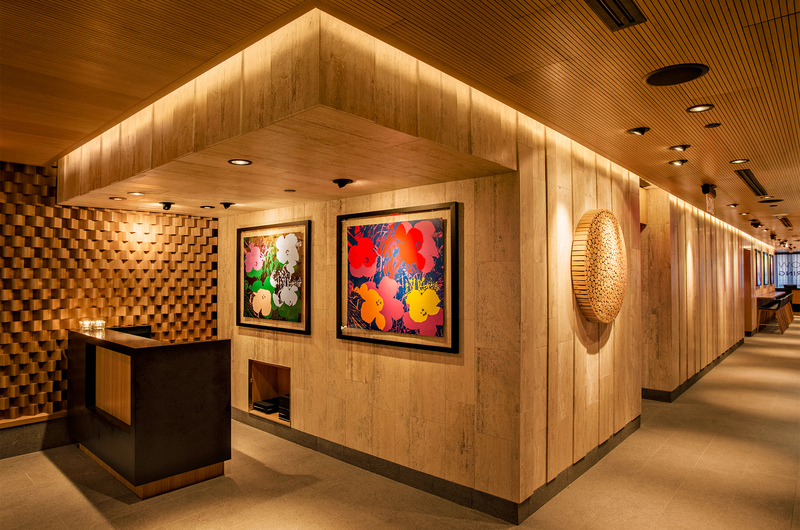 Facing the entry, the lounge and bar are illuminated by a floating display of hand-blown glass pendant lamps creating a sense of intimacy among diners. 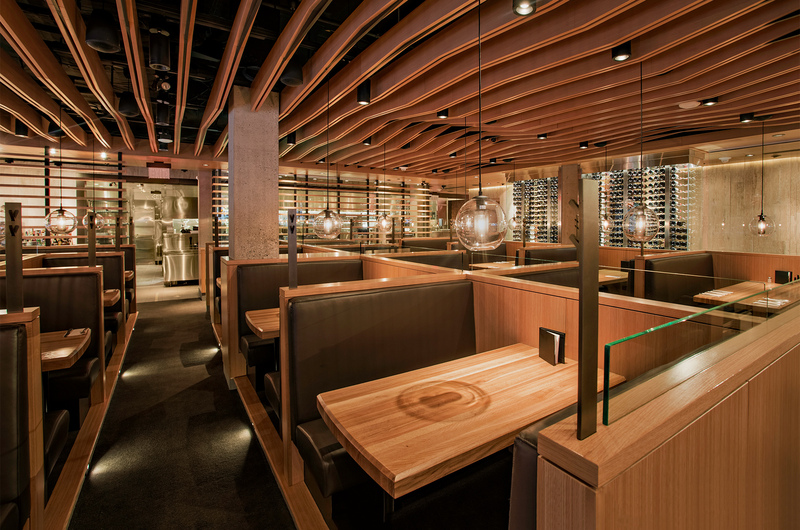 The adjacent patio features a fully retractable roof to accommodate Calgary’s climate year-round. 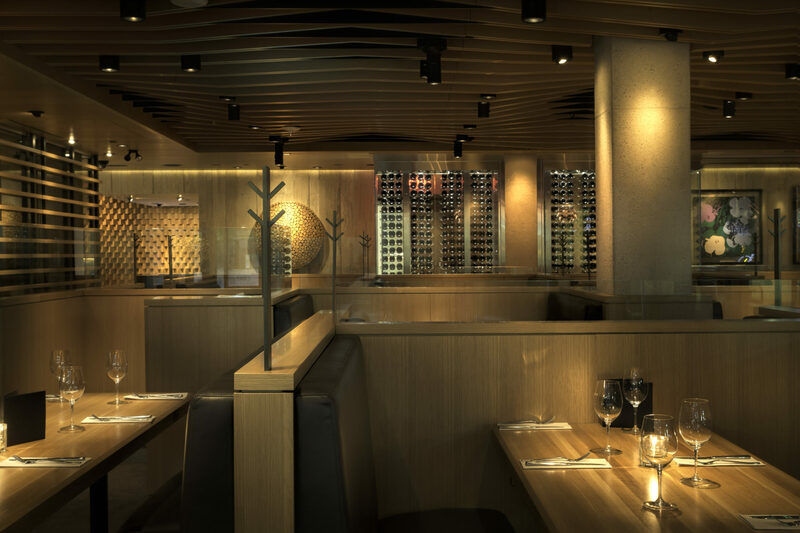 Additionally, retractable floor-to-ceiling glass panels surrounding the lounge blur the lines between the indoor and outdoor experience and enables diners to interact with the heavy pedestrian traffic, as well as a large-scale steel “Trees” sculpture designed to reduce wind gusts between buildings. Original art is displayed throughout featuring artists Mr. Brainwash and Andy Warhol.